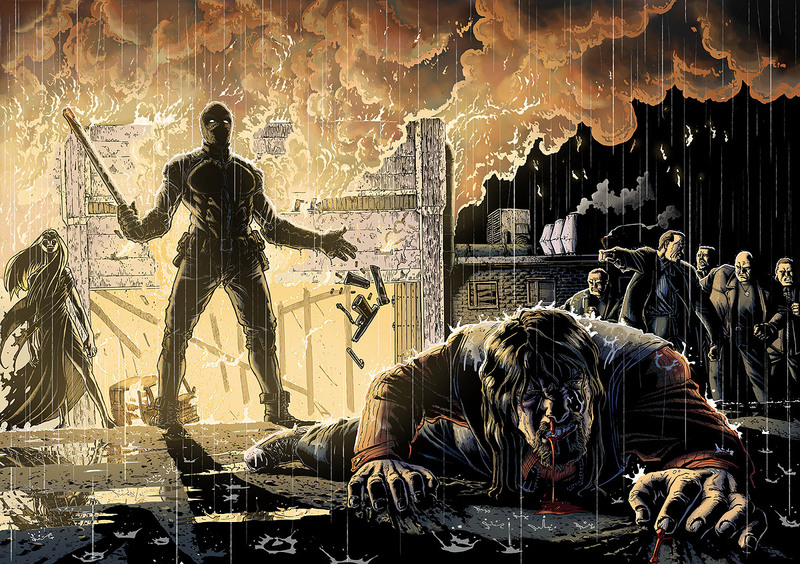 Who is this Rendel character anyway, and why the heck should we care about the Rendel movie? Fair questions. As for the first one, I can’t really tell you who Rendel is just yet. Not because I don’t want you to know, but because I don’t know either. In fact, no one besides the actors and the production team seems to know who he is. What I do know is that he’s angry, determined, and really knows how to pull off a black leather suit. Now, regarding the “why should we care” bit, I’ll put it in simple terms: the Rendel movie might be the best nitty-gritty action sci-fi flick of 2017. And yes, while I’m super excited about the whole slew of comic-based movies on the docket for next year (I’d list them but there are too many – how awesome is that? ), will any of them be nitty-gritty in the way that I’m talking about? Highly doubtful. The only thing I think (hope) will come close is Netflix’s Punisher series. Speaking of Punisher, he’s probably the closest comparison we currently have to Rendel in terms of backstory and motif. While not much is known about Rendel’s past, we’re told his family was murdered by a large criminal organization called VALA, and as a result, he is consumed with vengeance and hate. “Revenge begets revenge,” reads the tagline for the movie’s website. But Finland? Isn’t that, like, the Arctic Circle? Do they even make movies there? Well, actually, only part of Finland is in the Arctic Circle, and yes, they do make movies there. Not many, I grant you, which is why the Rendel movie could be a really big deal for the small Nordic country. It’s the first “superhero” movie to come out of Finland and has the potential to attract a bigger international audience and fan base than any other Finnish film (the global rights have already been picked up by Raven Banner). In fact, I’d wager that the only other Finnish film you might have heard of is Big Game, and to be fair, you probably only heard of that because it stars Samuel L. Jackson (and, on a side note, most of that movie was filmed in the Alps, not in Finland). However, there are some reasons to be excited about this movie coming out of Finland. First, it might mean that we get to see some variations on the typical dark alley/underground parking garage scenes (although we should expect plenty of those as well) that we see in films like this one. For example, here’s a video of some production work happening next to a scenic waterfall in one of Finland’s national forests. Another reason is that Finns have something they call “sisu,” which is their word for the ability to do what shouldn’t be do-able. In other words, if anyone can take $1.5 million and make a movie with the production values that are typical of a much, much higher budget, it’s likely to be someone Finnish. If you want something to back that up, consider the fact that the production crew worked 16-20 hour days for 8 weeks straight in order to shoot the movie. Is There Some Other Reason To Think the Rendel Movie Could Actually Be Any Good? I’m so glad you asked, because actually, I can think of at least three. 1. It’s for fans, by fans. In fact, Rendel is an original character who writer/director Jesse Haaja dreamed up as a teenager. In a sense, Rendel is representative of most comic book enthusiasts’ dreams of one day bringing their own superhero to life on the page or screen. Haaja’s commitment to making the Rendel movie a reality apparently came about as he sipped whiskey on his 30th birthday (although, if he’s anything like the Finns I know, it was probably more like shooting whiskey). 2. The fact that it’s an original character means we (the audience) might actually get surprised during the movie. It’s not that I’m not looking forward to the next Marvel/DC blockbusters as much as anyone, but let’s be real; one of the big reasons most of us liked Guardians of the Galaxy so much was that we weren’t overly familiar with the characters, so we didn’t know what to expect from them. Hopefully, Rendel keeps us guessing in a similar way. 3. The trailer. Oh, I didn’t show you the trailer yet? What on earth was I thinking? Well, here you go. Okay, Okay. When Can I See This Thing, Already? Uhhh…about that. What I can tell you is that the movie is in the post-production stage. The release date, meanwhile, is currently “sometime in” 2017. In the meantime, you can check out the official website and the Rendel movie Facebook page for more information. If you can read Finnish, you’ll be a step ahead of the rest of us. Browse around and you’ll find some really interesting promotional material, like a miniature Rendel figurine and Rendel condoms. Yes, condoms, and I’ll leave you with that.